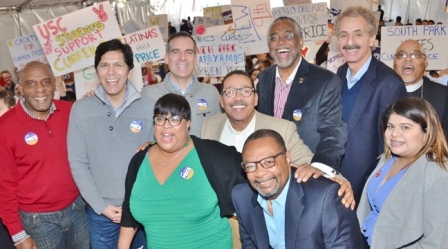 Los Angeles City Councilman Curren Price, who represents the Ninth Council District of Los Angeles, kicked off his 2017 re-election campaign on Jan. 21 at Total Restoration Church alongside 400 supporters, including Mayor Eric Garcetti, City Attorney Mike Feuer, Council President Herb Wesson, California Senate President pro Tem Kevin de León, Councilmember Gilbert Cedillo, and numerous other officials from state and local government. Community, faith and labor leaders, as well as local residents, also joined the Councilman to formally launch his campaign. Since taking office in 2013, Councilman Price has focused attention on critical issues affecting working-class families, such as narrowing the gap of income inequality, creating a steady pipeline of good-paying jobs and helping make neighborhoods in the Ninth District cleaner and safer. 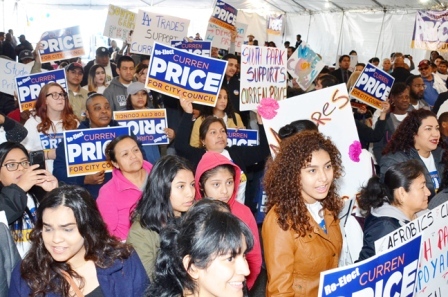 In 2014 and 2015, Price, who serves as the Chair of the Council’s Economic Development Committee, led the fight to raise the wage for hotel workers in Los Angeles, and was the author of a landmark legislation to increase the minimum wage for millions of Angelenos to $15 per hour by 2020, respectively. He has actively supported local projects that promote economic opportunity, including the $350 million, state-of-the-art Banc of California soccer stadium for the Los Angeles Football Club, currently under construction at Expo Park; and The Reef Project, a mixed-use residential-retail development that will transform 1,100 parking spots into a vibrant place to live, work, and play. These catalytic projects, and others in the pipeline—most recently The Lucas Museum of Narrative Art—are helping provide thousands of good-paying jobs and job-training resources for neighbors. 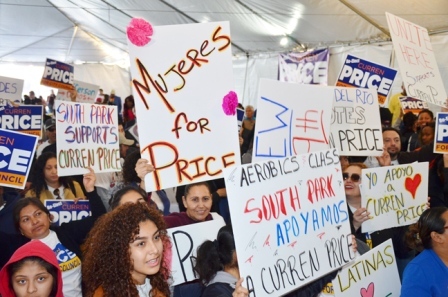 As a member of the Council’s Homeless and Poverty Committee, Price was also a sponsor of a $1.2 billion bond, which will provide much-needed funding to build up to 10,000 units of permanent housing and wrap-around support services over the next 10 years. Councilman Price remains committed to enhancing the quality of life for all South LA residents. Under his leadership, more than 15,000 tons of trash has been removed from neighborhood streets and alleys, over 1,000 trees have been planted along residential and retail areas, hundreds of new trash bins installed districtwide, and $40 million invested into public parks.